Site Definitions allow you to edit the most core information of your website. It is very important to complete your Site Definitions because search engines and browsers will use this information directly. Below are the fields available. Website Title: This title will be seen at the top of a visitor's browser as well as used by search engines to index your website. Contact Name/E-mail: These contact fields are used by the Perpetua Tech team to keep track of your most up-to-date contact information. 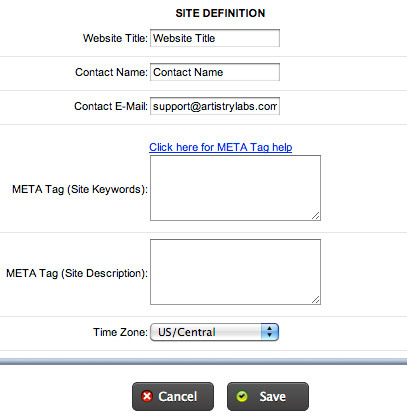 META Tag (Site Keywords): These keywords are used by search engines to index your site. The more accurate your keywords are in describing your organization, the more likely your are to be found in a search engine. META Tag (Site Description):The Site Description is what displays when your website is found in search results. Typically, search engines will display your Website Title followed by your Site Description.